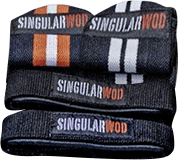 The Singular WOD mobile squat rack is the perfect complement to your strength and weightlifting exercises, use it at home or in the box and easily move it around your favourite training space. Our Singular WOD mobile squat rack is made from structural steel which gives it great strength and reliability during training. It can withstand up to 250 kg of static load and is compatible with the full range of rack accessories such as plate storage post for racks, triceps dip station for racks and thesafety support for racks. In addition, its black stove-lacquered powder paint coating finish makes it very resistant to blows, normal conditions of humidity and changes in temperature. It is very easy to assemble thanks to its system of bolted brackets. Its 1.19 m of height are more than enough to remove the bar from the rack pre-loaded or clean and for a variety of movements such as overheads or squats. It only takes up 1.5 m2 so it can be placed in any corner of your garage or box while doing other exercises. The Singular WOD mobile squat rack includes two50-mm J-Cups, so you simply have to assemble and ¡train! Maximum load capacity: 250 kg.